I have an illustration in this month’s Best Health magazine. 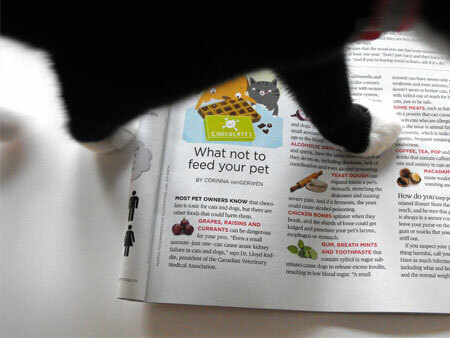 It’s an article about what not to feed your pet. … my kitty, as you can see, found it very interesting! I love’s me some cute little foots! That is adorable. I am such a fan!!! Wow, Lori, that is so cool. Congratulations! Thanks to the article that you illustrated re: what you shouldn’t feed your pets and your post about it…I now know that it can be fatal to feed dogs grapes, sultanas and raisins…I had no idea. Thank you so much.